Buche’ Perico (Corn and Pumpkin Stew) is the kind of dish I sometimes like to have to forget about the stresses of life. There are dishes like that, comforting. Having moved from a large city (Santo Domingo) a few years ago, one of the things that I like the most about Punta Cana is the sense of old-time community. It helps that none of us is from here, we all have to build support networks and lean on friends for help once in a while. Having left a one-horse town in my childhood, I thought I would never willingly return to small-town life. Was I ever wrong? Like in the days of yore I have found myself sometimes bringing foods for my friends and neighbors. At this pace I will soon be known as the Cookie Fairy. My neighbor B is an avid baker too. Lucky us. Once in a while she shows up with yummy things she’s baked. I got a pot of gazpacho from Aunt Ilana on Monday (yes, we are also neighbors), and I dropped off cupcakes for another friend’s birthday yesterday. I am also probably one of the most popular moms at my daughter’s class, seeing as I sometimes bring cookies for the kids. Cooking is a pleasure meant for sharing. Am I ever glad I don’t have to battle traffic for an hour to do so. I had promised you to bring you this recipe a few weeks back in an post I wrote about odd names in Dominican cuisine, so I grabbed my reusable shopping bag and walked the short distance to the supermarket to get the ingredients for it. Luckily it did not contain any odd ones (we live in a campo, remember?). So, I made a giant pot of this stew and called Aunt Ilana’s husband to tell him I had some for him. ¿What’s up this Buche’ Perico (Corn Stew)? This dish earned its place in our list of foods with bizarre names, as it translate into English as “parrot’s gut”. It hails from the Cibao region, more specifically from the Moca – Seybo region. If you’ve met Aunt Ilana’s husband, Pedro, one of the friendliest people I’ve known, you probably know that he calls himself “a mocano“, despite the fact that he was born in Ciudad Colonial. This was my chance to call his bluff. Not surprisingly he had never heard of this dish. “Not surprisingly”, I say, because I don’t think that even many “real” mocanos have heard of it. Anyway, I got Pedro’s seal of approval, which together with my husband’s is worth, I don’t know… two cents? Buche' Perico Recipe (Corn Stew): delicious and oddly-named corn and pumpkin stew. I love the contrasting savory flavors with a hint of sweet from the corn. Using a sharp knife cut the corn from the cob, making sure not to go too deep as the corn is very fibrous and tough. The knife should slide down easily. Be careful not to cut yourself, fingers are not part of the recipe. 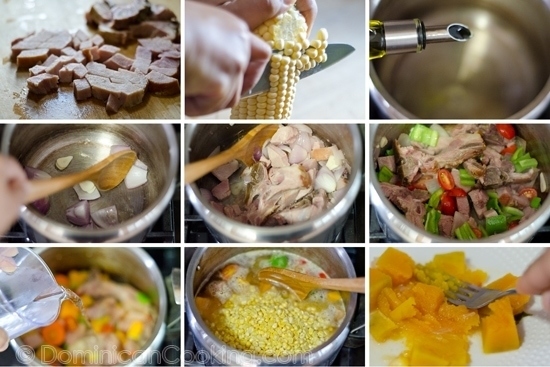 Boil the corn in the water until it is very tender, you can shorten the cooking time by doing it in a pressure cooker. It takes about 40 mins in a conventional pot, and about 20 in a pressure cooker. Maintain the same level of water adding more as necessary. Separate corn and water, set both aside. Heat the oil over medium heat in a heavy aluminum or cast iron pot. Add the pork chop and brown. Stir in the onion and garlic, cook until the onion starts to become translucent. Stir in tomatoes and cubanela peppers and cook and stir for a couple of minutes, careful that it doesn't burn. Add the carrots, celery and auyama. Dissolve the cornstarch in 1 qt [1 lt] of water (the water in which the corn boiled) and pour into the pot with the meat and vegetables. Add the corn and cilantro and boil over medium heat until everything is cooked through. Add extra water as it becomes necessary to maintain the same level. Scoop out half of the squash, mash and return to the pot. Season with salt and pepper to taste. Serve with arroz blanco. Some agrio de naranja goes great in it. While doing some research into this dish I found that, like with every Dominican dish, each household has a different recipe. Some people add longaniza (Dominican pork sausages) to it, some add smoked ribs, some don't use any meat at all. I suggest you go with whatever pleases you most. The one here has the ingredients that my family enjoys best. This is best made with tender, freshly-cut corn, but I couldn't find those, and probably neither can you, so I adapted the recipe to the corn on the cob commonly found in supermarkets. Tia Clara, this looks delicious… well, all your food looks great! The pictures are beaufiul (all of them), presentation of the food "awesome" -very professional and clear to understand (en palabras de a centavo – como decia Connie Mendez) and nothing to envy to "Vanidades" gourmet section. BTW I'm a Dominican, raised in the States (came to US when I was 13, now I'm 40+) and I'm planning to buy your book (Dominican Cookbook) for my teenage daughters – that will be my legacy to them. You really make me feel proud to be Dominican. Aunt Clara is it two cups or one cup of tomatoes? Brain hiccup! Just one cup. Thanks, Sarah! In the instructions you mentioned add tomatoes, however there are not listed on the ingredients. Would they be fresh tomatoes, crushed or whole can tomatoes? Also does this call for any tomato sauce or paste? You are right, thanks, I fixed that above.